Sun Art, which is quickly becoming known as the Wal-Mart of China, also competes with Wal-Mart (WMT), along with French retailing giant Carrefour. All three retailers are rushing to build stores throughout China and so far Sun Art is ahead of the pack. 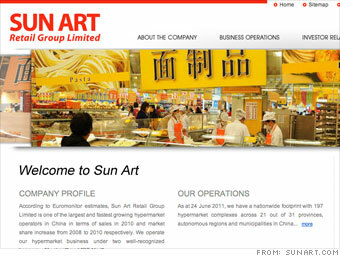 Sun Art raised roughly $1 billion through an initial public offering on Hong Kong's stock exchange in June 2011. At the time, the retailer said it planned to use the IPO proceeds to open new stores, which operate under the Auchan and RT-Mart names. Sun Art currently runs 230 stores in 24 out of 31 Chinese provinces. By the end of 2011, it had secured leases for 153 new stores, which will open over the next three years. The so-called "hypermarket" retailer, similar to a big box store, is seeing explosive revenue and profit growth. Its revenue grew roughly 22% to $8 billion in 2011 with profits growing 26% to $2.1 billion. China is the world's second largest economy, but it will still take years before living conditions are on par with other developed countries.